Medieval Books of Hours contain a rich history of beautiful illuminated letters and vines. This beginning hands-on class will explore the intricacies of the types of decoration used in these sacred prayer books. 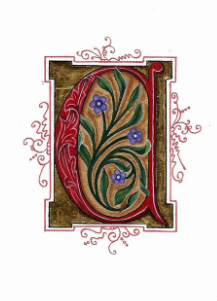 Several styles of decorated letters and vines such as those used by the scribes of old will be taught. Using a pre-printed worksheet, students will be led in a step-by-step manner. 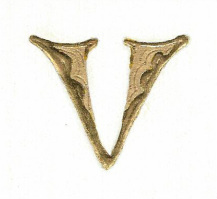 Instruction will include color mixing, painting techniques, application of gold leaf and shell gold. This ancient art will allow you to tap into your creativity in a prayerful way. Gold leaf is a beautiful enhancement to any illuminated piece. The play of light on gold is mystical and enchanting, however, it can be difficult to use at first. This class will teach you to apply gold leaf on paper using Instacoll as a base. We will build up layers of base to achieve a beautiful raised effect, lay the gold and bunish to a mirror shine. 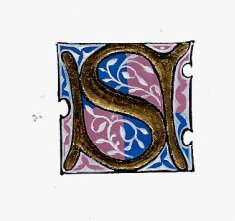 In addition to gold leaf, using shell gold should be in every illuminators repertoire. We will make our own shell gold, learn to apply it, burnish it and tool designs that will catch the light and make it sparkle. This class will introduce students to the beautiful art of calligraphy or serve as a review for intermediate students. Students will learn the tools for lettering and how to use them properly. Specific instruction will be given on the Foundational Hand with emphasis on understanding pen angle, stroke sequence and spacing. Students will leave with a good understanding of how the letters are formed enabling them to continue to practice and improve.